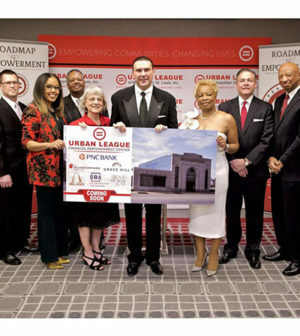 From The St. Louis American: PNC Bank donated its North Grand Boulevard Branch building to the Urban League of Metropolitan St. Louis. The building in the College Hill neighborhood will become the site of the Urban League Financial Empowerment Center in partnership with Grace Hill, St. Louis Community Credit Union, the U.S. Small Business Administration, St. Louis Promise Zone and St. Louis Development Corporation. The new center will provide critical resources to the community of College Hill, including teaching people about loans, managing money and small business support. Together, with the newer PNC facility just up the street, the College Hill community will continue to have access to a full spectrum of financial services and resources.